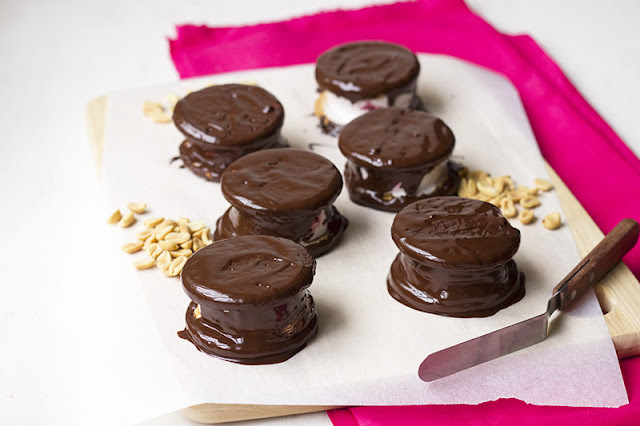 Wagon Wheels- Hello everybody, welcome back with ZetiraKitchen! Today I will share about How to Make Homemade Wagon Wheels. Wagon Wheels are dessert like sandwich that covered with chocolate and filled with melt marshmellow or you can add some jam too. They are perfect snack to enjoy your activity or you can wrapped up the homemade wagon wheels and put it in your lunchbox. Make homemade wagon wheels are very easy, so you never fail to make it. Let's to try! Cut the marshmallows into small pieces and spread it in all side of biscuit. Covered the marshmallow biscuit with another biscuit. Then put in microwave until the marshmallow have melted. Place chocolate in a bowlm then preheat in microwave until they have melted. Put the sandwich biscuits on a wire rack and take a spoon chocolate onto one side of the biscuits. Repeat until the chocolate covered all side your sandwich. let sit for 12 minutes.